Hot flashes keeping you up at night? Feeling a little warm around the noggin? Even though I’m typically f-f-freezing my tush off during the winter from my neck down, lately I feel like someone dipped my head in a vat of lava. I think it’s from my new headache medicine. While the meds work like a charm, they make me a bit hot-headed. Not the mean kind (usually), but in the most literal sense. What’s a girl to do? I can’t give up my favorite pillow, especially since it’s been helping so much with my neck! Picture courtesy of Comfort Revolution, because try as I might, my pictures came out horrible. Sal tried out the Comfort Revolution Cooling Pillow last year and loved it, but like I said, I can’t change out my whole pillow. Well, guess what? Now they make pillow cases! It’s called the Hydraluxe Cool Case. 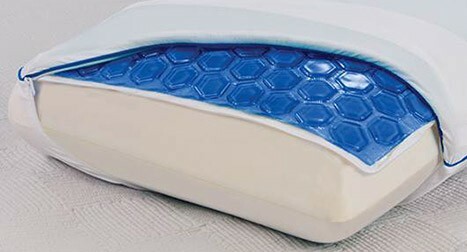 It has all the cooling power of the Cooling pillow, but fits right over any other pillow that you want to use. Best of both worlds! How does the Hydraluxe Cool Case Work? I have no idea. Seriously, by now you should know that I’m not a physics or science person. Let me look it up for you. Hold on. Okay, so basically, it has “built-in cooling gel technology to add soothing comfort to any pillow.” I’m sure it’s somewhat more complicated than that. I’m also sure it’s somewhat of a secret, otherwise everyone would try to shove gel into a pillow case! Don’t try to shove gel into a pillow case. Comfort Revolution has sleep experts and what not, so I believe far more research went into their Hydraluxe than that! You can take the gel lining out and wash the pillow case, which is fantastic. No one wants to sleep on a pillow case that they can’t wash, right? Ewww. When you get the pillow, let it sit at room temperature for about a day before you plop your pretty head down on it. That lets it acclimate. The only downside to the pillow is that after a couple of hours (for me, anyway), the gel seems to absorb the heat from your head and loses its coolness. You have to kind of rotate it when that happens. Usually I am asleep long before then, so it doesn’t bother me. If I wake up to use the bathroom and lay back down, though, I have to adjust. Other than that, it keeps my head cool! Cool heads prevail, as they say! Ready to grab a Hydraluxe Cool Case for the hot head in your life? Head on over to Comfort Revolution to learn more! You can also find the Cooling Pillow there too. Do you like to keep your head cool or warm when you sleep? Tell me in the comments! I have a Comfort Revolution pillow and it’s seriously awesome! It helps so much in the summer and those times I get headaches! Oh! I wanna try this pillow! I think it would feel like a treat especially on hot summer days and when you’re tired from work. 😉 I like to keep my head cool when I sleep.